Policeman were once known as “peace” officers. In their light blue uniforms, they walked a beat, making their rounds, interacting with people in the local community. Today, the color of their uniforms is dark blue or black, which in human psychology connotes authority and force; more commanding and less friendly. Now they are known as “law enforcement” officers. The change in terms is telling. Where the old municipal police mission was to protect and serve the public, the new attitude regards the public as wild and dangerous; potential enemies who may harm the police. This is the mindset of the soldier on the battlefield. In the military, the mission is to kill or capture the enemy, not to serve and protect. 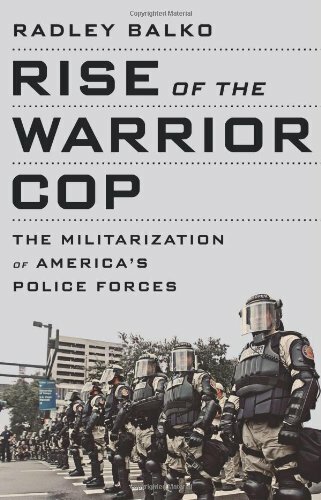 Militarizing the police has changed the institution. Police protection is now paramount, and the police are much more trigger-happy in response to any threat they perceive to themselves. A large part of the problem is that the nature of policing has changed. “Victimless” crimes, those not involving any actual victim, consume more and more of their time. Unlike traditional crime, in which a real victim comes forward — a person who has been defrauded, or robbed, or assaulted — there are no victims in victimless crimes. And if the “victims” won’t present themselves, then their “assailants” must be hunted down in some other way. That “other way” necessarily involves entrapment, paid informants, spying and monitoring, profiling, and the like. Fort Pierce, Florida police officer showing off the department’s new military-surplus mine-resistant ambush protection (MRAP) armored vehicle. Not only are police busy with victimless crime, they are now concerned with finding potential terrorists. I’m not against the police disrupting active plots and schemes, but when the War on Terror becomes a war on all citizens, when everyone is a suspect, things have clearly crossed the line. Anyone has the potential to be a criminal, and yet not everyone is. Military equipment purchased with Homeland Security grants and a U.S. Department of Defense program provides police departments with “free” armored personnel carriers, flash bang grenades and other incendiary devices, military-grade weapons, and military clothing. Check out this charming video embedded here. The police are dressed for battle and ready to play.